You are here: Home » News » Credible Forest Certification » Tyee: "The War Over Eco-Certified Wood"
June 3, 2009 -- When it comes to buying nature-friendly wood, two stamps of approval vie, with vast forests at stake. Which will win out? Big timber firms back the one critics call greenwashing. A contented-looking man stands in front of a posh house in a bathrobe, gripping a morning newspaper and coffee. The caption for this full-page New Yorker ad identifies him as "the new environmentalist." "These days, a growing number of consumers want the good life, but not at the expense of the environment," reads the copy. "So when they shop for everything from newspapers to building materials, they look for SFI certified wood and paper products." The year was 2007, and this ad was among the first shots fired in a high-stakes PR war that continues to play out across North America today. The combatants are the two largest rival forestry certification non profit organizations in the world: the industry-created Sustainable Forestry Initiative (SFI), and the Forest Stewardship Council (FSC), which was conceived by a coalition of North American environmental activists. At stake, then and now, is a multi-billion dollar international market for eco-certified wood products, which rewards environmentally-responsible forestry companies with improved access to retail and business-to-business customers. What both certification programs have in common is that their respective logos -- appearing on books and 2x4s and everything between -- carry a promise of "sustainability;" both indicate that eco-conscious buyers can relax and know they are buying a product that they can feel good about. What the rivals do not share, is a common vision of what sustainability looks like on the forest floor, and whether the differences between certification standards matter at all. "We don't believe that consumers are sophisticated enough to have learned at this point what FSC stands for versus what SFI stands for," says Kathy Abusow, President and CEO of SFI Inc. "Most of the large customers....are feeling good about recognizing and awarding that ten percent of the global forest base that is certified, rather than expending energy on trying to decide who is the A+ and A- student." The current certification battle started ramping up in 1999, the year Home Depot announced it would give "preferential treatment" to FSC-certified wood -- a move motivated at least in part by pressure from the environmental groups that created the FSC. Faced with losing access to the biggest North American markets, the SFI intensified promotional efforts, distancing itself from its parent trade group the American Forestry and Paper Association (AF&PA), even though as late as 2007, the newly "independent" charity was still receiving unspecified "contract services" from this trade group (as disclosed in its tax return). During this same year, SFI hired Canadian forestry certification expert Abusow as President and CEO, and with her, the U.S. public relations firm of Porter Novelli, which was paid $1.8 in fiscal 2007 to rebrand and rebuild the SFI from the ground up. "I am committed to growing SFI's recognition and importance among conservation groups, buyers, forest managers, industry, and policy makers," said Abusow of her plans for SFI at the time. SFI's total 2007 revenue grew to over 5.5 million, from $624,890 the year earlier, and just $344,155 in 2002. With this funding -- of which $3.2 million came from membership dues from member forestry companies -- the SFI waged a new PR campaign in North America, including billboards, full-page consumer magazine and newspaper ads, and a growing presence at influential printing and building trade shows. In 2008, forestry company Tembec Inc. was in the unique position of "upgrading" a large swath of mixed aspen and cottonwood near Chetwynd BC from SFI to FSC, shedding light on some of the differences between the competing standards. "Generally speaking, if you follow the B.C. provincial regulations, you're pretty darn close to meeting SFI," says Doug Braybrook, Tembec's Fibre Procurement Superintendent for the Chetwynd area. The company was required under FSC to conduct much broader consultations to create forestry management plans, including local First Nations, outfitters and trappers. Braybrook says the company had to identify areas of "High Conservation Value Forest," which were mapped with the input of local stakeholders; once identified, habitat for caribou, bull trout, rare birds and plants had to be managed to protect the wildlife. More intact forest was required on the edges of streams, lakes and wetlands, and Tembec performed a mandatory " pre-industrial condition assessment" -- which considered what their forests looked like prior to industrial logging, and how it could be managed to more resemble that state. "FSC is definitely the more onerous standard to get and maintain," says Chris Stagg, the Chief Forester for Tembec Western Canada, who was involved in the Chetwynd-area FSC process and today oversees nearly a million hectares of FSC-certified forests in East Kootenay. "It's the most expensive for sure, by a fairly wide margin." Stagg says this cost and effort does not translate directly into higher returns on Tembec's wood and pulp products -- but the benefit is still significant. "For getting access to the best customers, the Home Depots and Lowes for example, FSC certification really does make you first out the door," he says. "When times are tough and people are not calling others, they are still calling us." 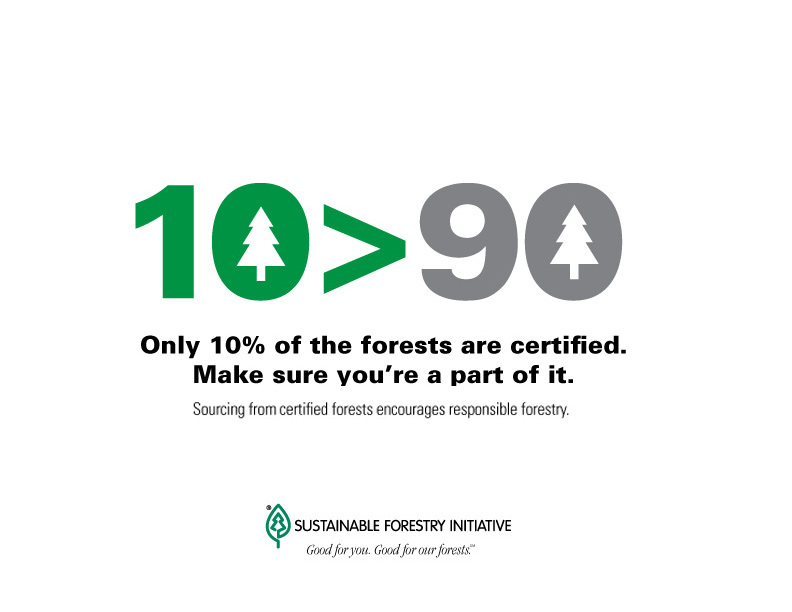 SFI's latest ad campaign -- launched this year in Canada -- focuses not on its rival FSC, but on the 90 percent of world forests with no certification at all. "We don't spend any of our effort trying to talk about FSC versus SFI," says Abusow. "We talk about what SFI does, why you can feel good being a part of it, and growing it." This "better than nothing" approach is paying off: in April 2008, international juice-maker Tropicana Products Inc. announced that the paper board used to make its juice cartons had received certification to the SFI fibre-sourcing standard. During the same month, 3M committed to earning SFI's Chain-of-Custody certification for all Post-it Notes made and sold in the US. SFI is currently waiting to hear this year whether it will be included in the U.S. Green Building Council's Leadership in Energy and Environmental Design (LEED) Green Building Rating System, which currently recognizes only FSC-certified building products. On the consumer front, SFI scored a partial victory last November when RONA adopted an "inclusive approach" for certified wood procurement -- which means they will carry SFI-certified products, although FSC-certified wood will be given "preference" to "better meets Rona's requirements in terms of relationships with indigenous communities and the conservation of biodiversity." SFI got the last word less than two months later, however, when they headhunted RONA's National Director of Forest Products, who now serves as their National Director, Market Access (Canada). While SFI blurs the differences between certification programs, environmentalists are aggressively exposing the differences, painting the SFI, in the words of one campaigner, as "a phony green label on standard industry practices." U.S.-based groups like the Rainforest Action Network (RAN) and the Sierra Club have banded together under the Alliance for Credible Forest Certification, highlighting destructive forestry practices on SFI-forested lands, such as high-elevation clear-cutting in Washington State's Chehalis River drainage in 2007. They also point to a 2007 case involving the same company, where a federal court in Seattle imposed an injunction to stop logging in SFI-certified spotted owl habitat. "We consider SFI to be forest greenwash," says Jennifer Krill, Program Director at San Francisco's RAN, a founding member of the FSC. "The marketplace cannot trust the SFI to deliver the environmental and social standards that customers are demanding." Krill says that SFI-labelled products can come from old growth forests, from huge clear cuts, and from tree plantations that were formerly ecologically-diverse forest -- and all the while, unwitting consumers and businesses buy the wood in an effort to be sustainable. Kathy Abusow refers to the campaign of groups like RAN and its partners as "background noise," and objects to referring to them as environmental groups. "I would refer to them as campaigning groups, because environmental groups have scientists and big institutional structures, [like] the conservation groups we work with all the time." But regardless of whether a real environmentalist is a battle-hardened campaigner or happy suburban yuppie portrayed in a New Yorker ad -- at least one conservation group on the SFI Board has moved to the FSC environmental chamber since 2007. "We tried to improve things during that time, although we would have liked to see more improvement," says Fran Price, Director of Certification Programs for the US-based The Nature Conservancy, which sat on the SFI board between 2001 and 2007. "In terms of global players aligned with our vision, we're [now] using FSC as a conservation tool." Compared here are the two dominant forestry certification bodies: the Forest Stewardship Council and the Sustainable Forestry Initiative. Companies are awarded two basic kinds of certificates by third-party auditors, who confirm that they meet the FSC- and SFI-created standards. Certificates are awarded for Forest Management and Chain of Custody -- the latter which theoretically ensures that all wood and fibre sources in a product are known. How do the two certification bodies compare? FSC: 13,043 Chain of Custody certificates, in 81 countries SFI: 527 Chain of Custody certificates, North America only. FSC: Launched by environmentalists in 1993; democratically-governed, member-based. SFI: Launched by U.S. forest industry trade group in early 1990s, now a registered charity. FSC: A non-government org that accredits national working groups to develop regional standards (e.g., there are four FSC standards in Canada.) SFI: A single standard (reviewed every five years) applied across all of North America. FSC: Third party independent auditors inspect to ensure companies meet FSC standards. SFI: Third party independent auditors inspect to ensure companies meet FSI standards. FSC: Performance-based standards dictate how biological diversity, species at risk, riparian protection, water quality, and forest health should be protected and enhanced. Required consultation with First Nations, labour, non-forestry interests such as trappers, outfitters, mushroom pickers, etc. SFI: Procedure-based standard does not generally prescribe requirements for managing forests. Companies choose their level of performance in regards to environment, consultation of stakeholders; levels vary from very high to a baseline meeting existing government regulations. FSC: Strict chain of custody (COC) requirements: consumers can trace where their wood products come from using numbers printed on each FSC COC label. SFI: Chain of custody requirements less rigorous. FSC: Companies committed to buying FSC wood and paper products include: Home Depot, Ikea, Nike, The Body Shop, Costco, Dell Computers, Disney, Google. SFI: Companies committed to buying SFI wood and paper products include: 3M, Tropicana, Rand McNally, Subway, Grand and Toy, Nestle. -- C. P.
Christopher Pollon is a Tyee contributing editor who has been published in a wide range of newspapers and magazines. This is the first in an occasional series on forestry certification issues the Tyee will be running in the coming weeks.